THE aisles of many Tesco supermarkets are undergoing a rapid transformation this week. Ramadan, the most holy period in the Muslim calendar, begins on June 6th, and the shelves of Britain’s biggest grocer are filling up with halal meat, dates and soft drinks, to help the country’s 3m Muslims break their daily fast with opulent sundown dinners. Ramadan is now big business for Britain’s supermarkets; it is probably the third-biggest sales period for them after Christmas and Easter. Tesco has led the way in targeting the Muslim consumer market in recent years and is reaping the benefit. It sells about half of all halal food in Britain’s supermarkets, and expects to make about £30m ($43m) this year on Ramadan sales. Yet for all this, argues Shelina Janmohamed, vice-president of Ogilvy Noor, an Islamic branding agency, the growing Muslim retail market remains woefully underserved by mainstream shops. There are an estimated 10,000 Muslim millionaires in Britain. Overall the spending power of the country’s Muslims is thought to be over £20 billion. But for a people of whom 90% say their faith affects their consumption, many complain that the high street still largely ignores them, particularly when it comes to fashion and fun—things like entertainment, travel and cosmetics. So young Muslim entrepreneurs, who believe, as Ms Janmohamed puts it, that “faith and modern life can go hand in hand”, have been starting up their own businesses to fill the gap. Nazmin Alim, a Londoner, used to work in an accountancy firm, so had to look smart, as the profession demanded, and modest, as did her religion. Yet, due to the vagaries of fashion, the ready availability of long skirts, for instance, could not be guaranteed. So she decided to make her own stylish, but modest, clothes. Aab, as she called her company (derived from the Persian word for water), started online but has grown rapidly; she opened two shops last year, now has about 60,000 names on the customer database and is launching a new collection every two weeks. Nazia Nasreen, a young mother from Birmingham, struggled to find well-made Islamic toys and books to teach the faith to her children, so she commissioned her own to sell. She started two years ago with four products, and now has 200. For these smaller businesses, too, Ramadan is the peak sales period. Aab’s website has already crashed once because of the high demand. Many of these startups appeal to a relatively new cohort of young, affluent Muslims, second- or third-generation immigrants who want to maintain the values of their faith while participating in the consumer culture in which they have grown up. Ms Janmohamed calls them Muslim futurists. Others, like Navid Akhtar, use the phrase global urban Muslims, or “gummies”, as most of them live in cities such as London. A filmmaker, Mr Akhtar launched a video-on-demand service last year called Alchemiya, which offers Islamic-themed documentaries. The biggest interest has come from schools, he says, to teach children about positive aspects of Islam. 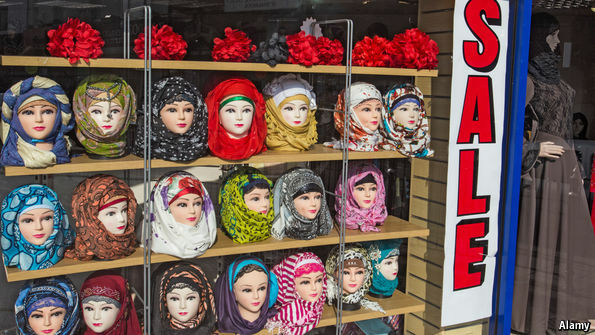 Another feature of this new Muslim market is that it is driven strongly by women. As they bear most of the burden of the faith in terms of modesty, so they have the greatest incentive to look for products that preserve it but offer them some style and luxury at the same time. As well as clothes there is a burgeoning market for cosmetics without alcohol-based ingredients, and for upmarket holidays for Muslims at hotels with private swimming-pools. There is a flourishing crossover market as well. The London Beard Company was started by Abrar Mirza last year to exploit the fashion for the hipster beard in trendy parts of east London. He sells premium organic oils for grooming beards that appeal to Muslims and to customers of all faiths, hipster or not. Mr Mirza says that sales could triple over Ramadan and that about half of his customers are women buying his concoctions as gifts for their men. Many of these startups have attracted interest abroad. Businesses in Muslim countries like Dubai and Turkey, for instance, are interested in franchising Aab. There is nothing modest about the potential of this new British export. I think there are two major negatives in the above. The first is the mention of “Islamic branding”. Pause for a moment and consider what branding is. And brush aside the assertion that it is all about “giving the customer confidence in a name he can trust” or somesuch tosh. It is, ultimately, and always, about charging a premium for the NAME, rather than the qualities and attributes of the product. This comment could turn into an essay if we explore examples and follow through the suffering it causes, from teenagers heartache at not having the best Nikes rather than an unbranded product with identical performance, to the financial stress on the man hidebound to drive the new BMW he can’t afford and doesn’t need as the Kia would’ve done the same job for half the money. Branding is, ultimately, BAD. The new seller who creates a brand to identify her/his product in the market of course (most often, probably, I hope) starts with the good intention simply of identification, but I doubt that any (that are successful) will in future resist the temptation to be “rewarded for their hard work” by gross overcharging once image-desire and ego in customers overtakes logic. My second concern in the article is the phrase “…want to maintain the values of their faith while participating in the consumer culture in which they have grown up.” I’ll call that an oxymoron and leave the explanation for another day as anyone with a braincell should by now have woken up to “consumerism” being one of the darkest facets of kafir.